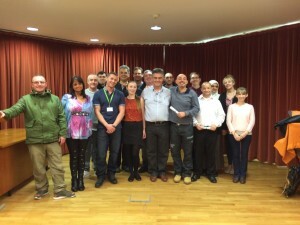 On the 5th of December our Peer Mentor program funded by The Big Lottery came to an end. Over five years we have given training and work experience to over 500 individuals. When the project began we were still based in the ‘old’ Basement and courses took place in hostels, recovery centres, day centres and rehabs across the region. It was hard work for our training team back then, lugging equipment and files across the city (and beyond) in order to deliver. With the opening of the new building with its own training suite, the course made its home here and really took off. For many it was the first accredited qualification they had ever achieved and for others it became a stepping off point for a career in this sector and it was this diverse cross section of life that made the courses vibrant and enjoyable. The training team developed successful relationships with each peer, often coaching individuals who were struggling with the academic work. We doubt many of those who completed the course could tell you all they learned but every single one of them knows who trained them! None of this would have been possible without The Big Lottery Fund and Open Awards. The Lottery saw the potential of the project back in 2009. At the start we intended to target those newly in recovery or ready to make the next step in their journey but over time, the course was adapted for delivery to a range of specialities, all with peer support at the core. Open Awards worked closely with us in developing and improving the content and delivery of the program and without their occasional guidance, the journey would have been a lot less smooth. The most important people to thank are those who completed the course. Many of them went on to active roles within The Basement and other services. Some went on to complete our 10 week volunteer course and more than a few are now in paid employment, not just here, but in services across the city and beyond. We held our final graduation on the 4th December and it was a day of mixed emotions, joy for those who had achieved their awards but tinged with sadness that this was the end. Whatever the reason that brought them to the course they should feel proud to be part of such an amazing group of people. They make us very proud!